A verb that ends a sentence is usually followed by this auxiliary, while a verb that ends a relative or noun clause is not. The masu-form usually expresses definite future actions or events, the speaker's intentions, present habitual actions, or potential actions. The progressiv form with masu expresses continuing actions or states. masu follows the conjunctive form of verbs. Watashi wa ashita shinkansen de kyouto ni ikimasu. 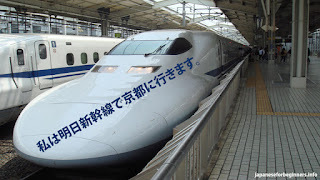 I will go to Kyoto by shinkansen tomorrow. Kanojo wa isshoni ryokou ni wa ikimasen. She is not going with me on the trip. Heikaishiki wa juu ji yori okonawaremasu. The closing ceremony will be held from ten. Watashi wa mai asa gohan to miso shiru o tabemasu. I eat rice and miso soup every morning. Watashi wa amari tabako o suimasen. Kanojo wa ima asoko de shinbun o yonde imasu. She is now reading a newspaper over there. Watashi wa totemo onaka ga suite imasu. Kare wa mou sono kaisha dewa hataraite imasen. He is not working at that company any more. Kono hoteru wa keshiki ga yoku miemasu. We have a good view from this hotel. Watashi wa kinou toshokan de maiku ni aimashita. I met Mike in the library yesterday. Mou sono hon wa yomimashita ka. Have you read that book yet? Isshoni oishii ryouri o tabemashou. Let's eat some good food together. Shall I shut the window? Ocha demo isshoni nomimasen ka. Would you have tea (or something) with me?